R4 news this morning talked about this, again in rather hostage-to-fortune terms. They were asked, "What use will this be", and in reply started talking about making climate projections relevant to, errm, London and so on. To the extent that the new toy can model at a finer scale the manhattanization of london, maybe. All those new buildings are going to change the air circulation around the center of the city. There are urbane models that simulate city environments in considerable detail. I only know this because I once attended a session on the topic at the EGU. The models really did seem very clever but I got the impression was that there was such a gulf in scale that there was not much communication between the urbane modellers and the climate modelling modellers. Some time between 7 and 8 am this morning. a. I think we were listening to R4 then. Obviously not very carefully. b. That is no surprise to me. Having said that, now you are a professional and all, doesn't your code have to be a little more presentable? One of the world's most powerful supercomputers is to be installed at the Met Office in Exeter. At a cost of £97 million, the machine is designed to improve the accuracy of weather forecasts and projections for climate change. The chief executive of the met office is Rob Varley. It could have been earlier, I was awake earlier than usual today. Code: good question. I have a similar Q from you saved up to answer some time on da blog. All our code is commercial-in-confidence, so no-one else ever sees it. But internal review is far fiercer than back in the sci days. There is an audio clip of an interview with Rob Varley of the Met Office as a sidebar to this BBC article. RV: We can tell you that the global average temperature is going to increase by 3 or 4 degrees if we carry on as we are, but the critical question is what is that going to mean for London? What is it going to mean for Scotland? What is it going to mean for my back garden? At the moment the general looks that we can produce really don't answer those kinds of questions. Q: So you're saying you're going to be able to predict climate changes in temperature for individual British cities into the future? RV: For regions of the UK into the future, in a way that is helpful for people who need to plan, in particular in terms of investment on infrastructure, in large-scale long-term projects. Q: But you're still going to be dependent, aren't you, on the modeling, the computer modeling, which some people say is pretty inaccurate and can't really give us a proper picture of what is necessarily going to happen. At 0:46:27. Give us an example... if we look at the climate timescale, answer the real questions people need to know, we can do global, but people need to know what does that mean for London, for Scotland... predict for individual cities?... For regions. The authors of this new paper give credit for their results to being able to do a very large number of simulations across a variety of models, which I guess implies lots of computer resources. Unless this is some sort of unique case (doesn't sound like it), it seems like increased resources will make a difference for at least some studies. Comment? There's no question that we can do more calculations and run larger ensembles with a bigger computer. What I was objecting to was the claim that making a higher resolution model would result in more reliable climate predictions. 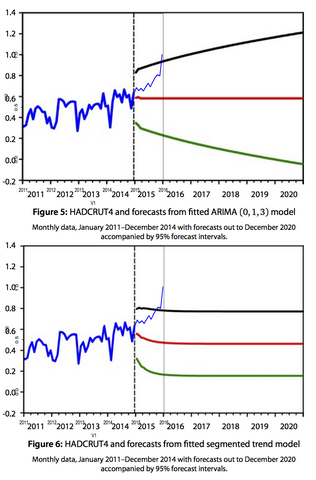 Having listened to the R4 interview, it was notable that the chief exec of the UKMO quite deliberately focussed on predicting climate change on the local scale (and not on weather prediction where he would have been on much more solid ground). This optimism is not justified by any historical precedent or scientific analysis. It's just wishful thinking. Here's what seems to be a similar claim. Regarding that last, is the difference that the claim was made after some due diligence rather than before? Ah, OK, you meant *just* higher resolution, right? I had missed the nuance. Although... with a bigger, faster machine, why would one ever change only the resolution? The only instance I can recall of someone making a specific claim about higher resolution alone making a big difference is Maslowski for his regional Arctic model vs. the GCMs. He said (this was several years back) it allowed his model to resolve warm water encroaching through the Bering Strait. But I suppose this is a highly constrained example. I assume that by now you will have seen this from Tim Palmer. Isn't this more of the same (although with reference to future computers, not the new MO one)? Well, I wasn't trying to be too nuanced or precise. But the main claims for the new computer seem to revolve around resolution, and it's made precious little difference in recent years. WRT Tim Palmer banging the same old drum, he's been doing that for a number of years now, I'm pleased to see he is moderating the more implausible elements of his proposal.